The themes for Sweet Stampin' Challenge (cute & cuddly)and Cards In Envy (stitching) provided the inspiration for this card. I have a friend who will be getting this as her late birthday card. Papers by DCWV and K&Co. Diecut by MME and image is by Bugaboo Stamps. Sentiment is computer generated. Linda, this made me giggle! I just adore it and I know your friend will as well. 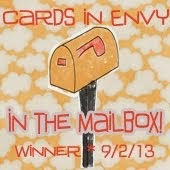 Thanks so much for joining us at Cards In Envy! Adorable card, Linda! That little cow is so cute and the "Hay" is a great idea! Love the color and your take on the sketch! Thanks for joining in with us at Cards in Envy! ahhhh super cute, LOVE the cow!!!! sooo glad you played along with Cards in Envy!! Such a cute card! Thanks for playing along with us at Cards in Envy. Oh this card is sooooo cute! Thanks for playing along with us at Cards In Envy! Oh this card is soooo cute! 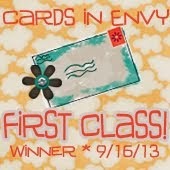 Thanks for playing along with us at Cards In Envy!